After the recent statement of Union Home Minister Rajnath Singh according to which mob lynching is a state issue against which the local governments should take ‘strict actions’ and the subsequent walk out of the Opposition from the house as a symbol of its disapproval to the statement; we all get an opportunity to dig deeper into the issue and analyze the operation of mob lynching in Modi Raj. Why only Modi Raj and why only in the Modi Raj are some of the significant questions that the article seeks to present. Cases of mob lynching are not new but what is new and disheartening are the figures which show that 86% of the people killed due to cow-related incidents are Muslims and 97% such cases have taken place when the NDA government came to power (based on an article of Hindustantimes). In such a situation, attributing these incidents to the recent rise of Hindu nationalism which arose with the rise of BJP sarkar cannot be simply dismissed as baseless. 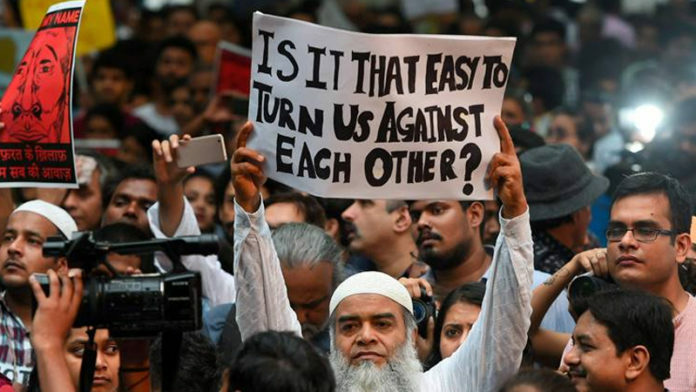 The incidents cannot be simply done away by raising the vocal cords to emphasize that the mob lynching cases were much more when the UPA government was in power or that these incidents are a natural outburst due to the genuine feelings of the Hindus or that eating beef is not necessary to follow Islam or Christianity or that mob lynching is a state issue. Whether or not these above statements given by BJP politicians are true is a secondary issue; the primary issue is how BJP seeks to explain the communal prejudice: the specific increase in the mob lynched deaths of the Muslims and the Dalits. Is the supportive silence and the hollow noise of the BJP an attempt to strike fear into the minds of the minority communities or a way to convey that the law cannot protect the minority? What is even terrifying is the process of normalization of these radical incidents. When the victimizers fearlessly post the videos on social media and they become viral, it is a clear indicator of the fact that the victimizers see this as an act of pride and bravery rather than a horrendous act of shame, remorse, guilt, repentance. The religiously and emotionally manipulated people share such things at such a huge level that it creates an illusion of mob lynching not being normal: the norm of today. Just because a certain community has a different set of morals, some Hindus are manipulated into thinking that other communities are lesser beings. This creates a gap and it is this gap which makes possible the death of humanity when one human kills the other and does not even feel remorse for the same. In such a situation, the violence perpetrated becomes legitimate, socially and politically, if not legally. It is not only the death of the true essence of democracy but also the death of humanity which makes mob lynching an issue large enough not to be dismissed as a state issue which is simply a result of the spread of local rumors. It is time that BJP answer these issues with the steps taken by them to prevent such horrendous crimes. The number of lynching cases being higher when the UPA government was in power does not free them from the questions raised on them. New Acquisition for Snapchat – Chat via drones?